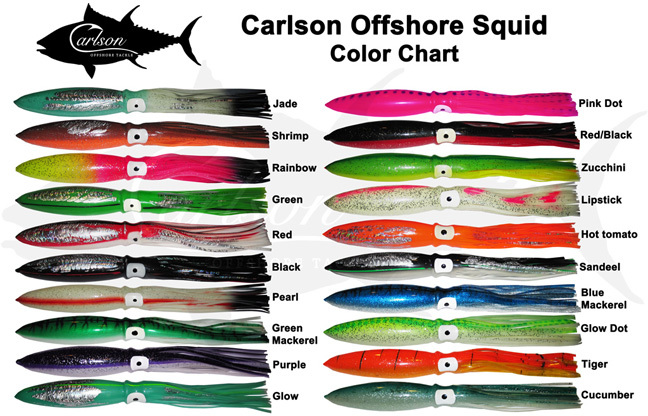 Carlson Offshore Squid are available in 5 sizes and 20 different color combinations. The 7" and 9" squid are the perfect size squid for fishing School Tuna, Yellowfin Tuna and all the big game in the canyons. The 11" and 13" squid are the most popular squid in pursuing medium size Bluefin Tuna. The 18" squid is designed to be fished for Giant Bluefin Tuna and is especially popular wherever big squid exist off the coast from Maine to North Carolina.